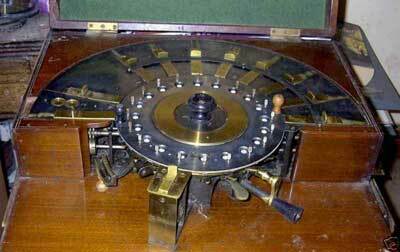 In 1883 Joseph Edmondson from Halifax, England, received three Great Britain patents for a circular calculating machine, based on the stepped-drums mechanism (patents №GB188316, GB18830016 and GB188300016). The machine was manufactured for some time in Halifax, by the company Blakey, Emmott & Co, a producer of telephones, but it is unknown how many devices were manufactured. The machine was initially introduced in a lecture to the Physical Society of London in February, 1885, then in several other sources, like Macchine da Calcolare of Giuseppe Pastore, 1885. Edmondson returned to the circular stepped-drums mechanism of the machine of Philipp Matthäus Hahn, although the construction of Edmondson is quite different. The machine is a quite solid brass device, with dimensions 48 x 41 x 15 cm and weight some 20 kg (including the wooden case). Eight number slides are placed radial on the outer fixed portion of the machine. 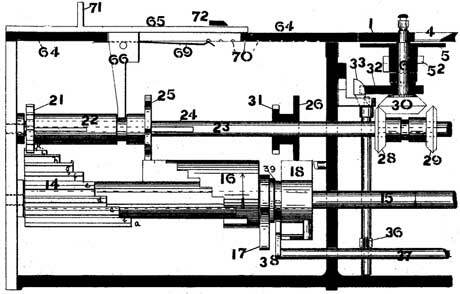 The hinged slide of the straight type of machine (e.g. 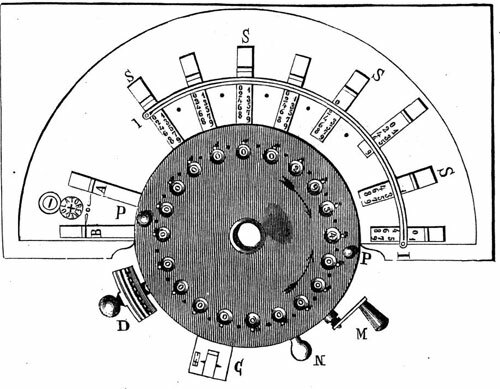 machine of Colmar) is replaced by a circular plate, carrying 20 figure discs, each of which—depending on its position relative to the number slides and driving handle, respectively—can serve either for recording the result in multiplication, or for setting the figures of the multiplier. Stepping is performed by lifting this plate, rotating it through one-twentieth of a revolution, and lowering it again. To multiply, the figures of the multiplier are set on the middle plate and those of the multiplicand on the slides. The driving handle is then turned to the right and the plate stepped clockwise until all the digits of the multiplier have been brought to zero. The product then appears in the apertures on the middle plate. The machine is provided with a zero-setting mechanism with which some, or all of the windows may be set to zero. By sliding the Lid of the box to the right, the hinges will separate, and the lid may be laid aside. Turning to the left may strain or break the machine. The Number Slides, the Index Slides, and the Regulator Handle should only be moved when the Driving Handle is in its lowest position, i.e., opposite the stud. The Regulator Handle should always be pushed home to the extreme right or the extreme left. The Number Slides and Index Slides have Springs underneath, which drop into notches when the slides are in the right positions. The click of the Spring should be observed when setting a Slide. If the Machine meets with a stop in its working, it should not be forced. The cause will probably be found in the neglect of one or more of the above directions. Edmondson's calculating machine attracted enough notice to be favorably mentioned in the 1911 Encyclopaedia Britannica, almost thirty years after its introduction.